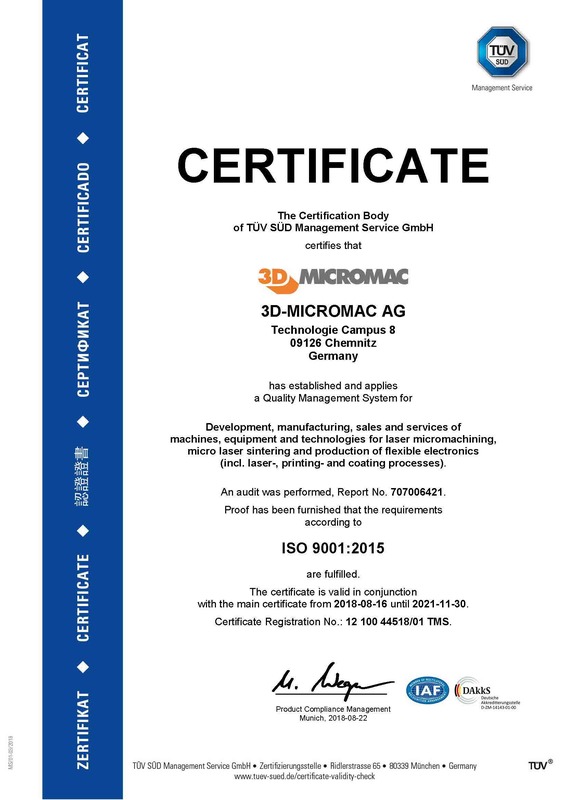 3D-Micromac is the leading specialist in laser micromachining. Our team of experts develop processes, machinery and complete systems at the highest technical and technological level. 3D-Micromac systems have been successfully implemented in various high-tech industries worldwide. This includes photovoltaic, semiconductor, glass and display industry, micro diagnostics, and medical technology. Our target is to completely satisfy customer demands even on the most complex projects. 3D-Micromac adheres to high-performance and future-oriented micromachining processes at high production efficiency. Our technologies have set international standards for true innovation. Since we place great importance on continually expanding our know-how, we are diligent about keeping up with the latest research. On a daily basis, we combine recent results with our customers’ demands to realize them in practice. 3D-Micromac AG was founded in 2002 in Chemnitz by Tino Petsch with a total of six employees. Since then, the company has grown to more than 190 employees today. In its strategic alignment 3D-Micromac concentrates particularly on international high-tech markets. We are one of the first companies in the world to focus on the use of ultra-short pulse lasers for the processing of materials. We also specialize in the use of excimer lasers for microprocessing. More than 100 excimer laser micromachining systems produced by 3D-Micromac AG are currently in industrial use. In a period of 10 years 3D-Micromac AG has carved out a strong position for itself among manufacturers of laser micromachining systems. With that we have established a strong foundation for dynamic growth in international markets. More-than-Moore (MtM), System-in-Package (SiP), as well as 3D high-density integration technologies are a prerequisite for enabling the design of compact microelectronic devices e.g. needed for future smart cities. Target of this project is to explore and to develop new diagnostic tools and advanced methods for material characterization, defect localization, efficient sample preparation, physical failure analysis techniques and workflows to enable reliable advanced micro-systems based on MtM, SiP, and 3D technologies for European core applications. The four major European semiconductor and system suppliers Infineon, STMicroelectronics, Bosch and Thales will collaborate with eleven equipment and analytical method suppliers from Germany and France. 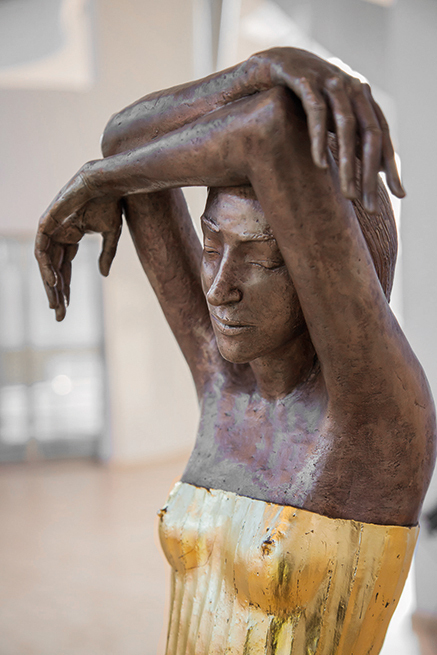 The work is supported by five academic institute partners. This collaboration will strengthen the competitiveness of the semiconductor and system suppliers to design innovative MtM and SiP products in respect to reliability, quality, cost and shorter time to market to ensure leadership in a global perspective. The project will also support European analytical equipment providers, many of them SME, to explore new market opportunities, design new equipment, and to align their developments to future needs of new system integration technologies. This project has received funding from the Federal Ministry of Education and Research under grant agreement no [16ES034]. A main aspect in technological developments for photovoltaics is the reduction of cost per power of the solar panel. This can be achieved by increasing the „cell-to-module“(CTM) key performance indicator, e.g. by reduction of losses. Through dividing the solar cells in half cells before integrating in modules electrical losses can be reduced. Furthermore a technology for cutting solar cells is especially interesting for national producers of special solar modules who can use it for the production of special formed modules. The aim of the project SOLAR-TLS is the development of an industrial usable process for cutting solar cells based on „thermal laser separation“(TLS). The main goal is to separate the cells without inducing damage at the cutting edge. The electrical and mechanical properties of the cells after cutting are in the focus of the investigations. Those properties should be unchanged after cutting. Therefore TLS is a promising approach as TLS dicing works without remove of material and create a smooth cut nearly without deterioration. This should lead to an increased lifetime of the solar modules. This project has received funding from the Federal Ministry for Economic Affairs and Energy under grant agreement no [0325893A]. The target of the POLDI_plus project is the development of processes for economic production of high efficiency emitters with low charge carrier recombination. Thereto the project part of 3D-Micromac will provide an important contribution: equipment and process development, process integration into the PERC process as well as cost calculation. Approaches for the further substantial increase of the throughput should be developed with respect to the equipment. All components have to be adapted to the requirements of the new high efficiency laser processes. At the end of the project a throughput of 5000 Wafer per hour should be reached. Firstly the developments are oriented to the state of the art. Approaches for precise local laser doping based on lean equipment concepts should be developed as well as a process based on a cost efficient infrared laser source. At the end of the project the equipment should allow the aligning of the selective emitter to the printed electrode with a precision of ±10 μm. This project has received funding from the Federal Ministry for Economic Affairs and Energy under grant agreement no [0324079C]. The outcome of this project should be a set of processing methods that will allow production of customer tailored ‘panels on demand’ with specified PV panel dimensions and color for small production batches and low added costs. The ‘panel on demand’ technology will be developed, prototyped and field tested in building elements. This opens up a huge variety of possibilities and niche applications for BIPV. In order to investigate the potential of the technology, three different BIPV applications for the ‘panels on demand’ will be developed: A façade system, a roof system for new built houses and a roof system for renovation of houses. 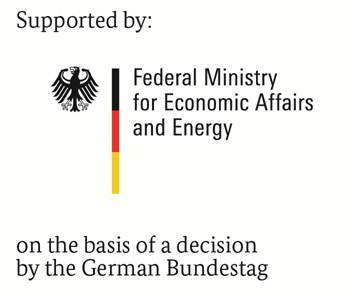 Coordinator: NEXT ENERGY EWE-Forschungszentrum für Energietechnologie e.V. It is the ambition of the POSITION-II project to enable innovation in Smart Catheters and Implants by the introduction of open technology platforms for: miniaturization, in-tip AD conversion, wireless communication, MEMS transducer technology and encapsulation. These platforms are open to multiple users and for multiple applications. 3D-Micromac will provide in frame of POSITION-II precise laser micro processing of small parts for Smart Catheters and Implants. The Position-II project has received funding from the European Union’s Horizon 2020 research and innovation programme (ECSEL JU) under grant agreement no . For the past 16 years, the name 3D-Micromac AG stands for highest quality and satisfied customers. Therefore, we are very proud to be certified to the ISO9001 quality standard since 2003. The certification covers the entire spectrum of development, production, sales and service of our machines, plants and technologies. With this certification, we prove our successful quality management and the efficiency of our process chains as well as our efforts to a continuous improvement. By constantly optimizing all internal business processes, we set the course for the steady growth of our company and for a lasting partnership with our customers and suppliers.